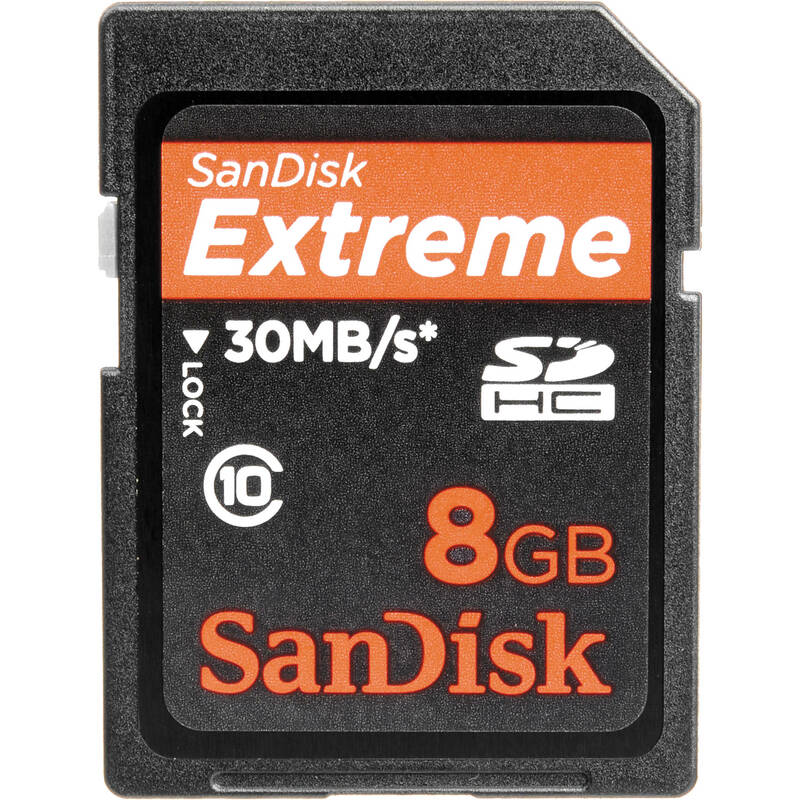 The SanDisk Extreme SDHC Class 10 Memory Card is designed specifically for high-end, professional photographers who work under extreme conditions and expect the very best in products and support services. This Class 10 card has a minimum of 30MB/second sequential write and read speed (based on SanDisk internal testing), which allows for faster capturing of large image files to the card, faster viewing of images and faster data transfer rates. SanDisk Secure Digital Cards can be used in a variety of digital products including digital music players, cellular phones, handheld PCs, digital cameras, digital video camcorders, smart phones, car navigation systems and electronic books, and is rated Class 10 for speed and performance. 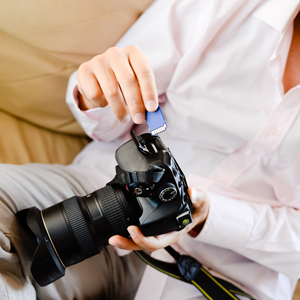 The SDHC Card also contains a security feature for the protection of copyrighted data. Features ESP Technology (Enhanced Super-Parallel Processing Technology), which provides best-in-class performance. Tested in extreme temperature ranges from -13 to +185° Fahrenheit so that they can be used to shoot photos in any weather condition. Shock and vibration tested with industrial-grade RTV included, which is designed for rugged use. Get a Free download of RescuePRO software to recover photos or other files that are accidentally deleted. 8GB Extreme SDHC Class 10 Memory Card is rated 4.8 out of 5 by 516. Rated 5 out of 5 by Ponchai from Excellent Memory Size and Speed Personally I hate to carry more than 1 card because I tend to either misplace it or never use it. With this card 8GB is plentiful when taking pictures or capturing video with my Nikon D90. The speed is definitely noticeable when I connect to my PC to download, delete or even manage it. It is also recommended for the Nikon D90 if you want to take bursts of photos. Not just your ordinary card. I would recommend this to friends and even upgrade to the next one up. Rated 5 out of 5 by Anonymous from SanDisk Is Worth the $ I use the SanDisk to cature video and stills - both professionally and personally. Despite one failure three years ago, since I started shooting video with DSLR, I've stuck with SanDisk. Others may claim write speeds at class 10 speeds, but the results don't really bare that out. Only SanDisk has routinely managed large video files and been able to keep up. 8GB is the perfect size for file management and, in my opinion, helps to keep the DSLR from overheating. With the rebate through the end of the year, there's no sense in trying to save money with lesser cards. While other brands may not have failed, they can't write as fast. Rated 5 out of 5 by Anonymous from I will be buying this again... I use this card in my Nikon D90. I recently got stop wave action in the ocean storms in So.Cal that would never have been possible with the other Memory Card I had in my Canon Rebel. The Canon is great, the card I was using was not... This card is so amazingly fast. I see now why the other reviewers recommended the Extreme III SDHC series. The video I shot was also perfect. I will be getting another 8GB for Video only since it uses a lot of memory. Anyone who is serious about their digital photography should use these Extreme III memory cards. Rated 5 out of 5 by Jiggy from Just the Ticket One of, if not the fastest card I have ever used. It is almost like having a motor drive attached to a digital frame. I had done a lot of research in preparation to buy a Class 10 SDHC card because of the transfer rate. I was not disappointed with the performance of this device. I purchased an 8GB card for my Nikon D90 and 85mm f1.8D Nikkor lens. I wanted to see just how fast this thing was in comparison to the reviews that I had read. After setting up the studio with sufficient lighting to get some good Head Shots I started firing and it seems that I was shooting close to 4fps. I mean no lag time whatsoever. They are not cheap but, you get what you pay for. Rated 5 out of 5 by dcfoto1 from Perfect! I bought this memory card to use in my new Leica M9. I typically do not buy large cards (even for larger MP cameras) b/c I feel that even the best cards can be unstable at times. So I always dump images off cards onto a portable external (SPACE) drive. It's like changing film to me. The performance of the card within the camera and within the space drive is exceptional. Best I've found so far. Highly recommend this product for professionals. I shoot weddings with the M9 and I typically shoot about 2500-3000 shots in a day. So I am filling cards and emptying them frequently. I've never had a problem with this company's memory cards, be it this type or type II compact flash cards in my Canon gear. Good luck and I hope this review helps. Rated 5 out of 5 by A. Lee from A must have for a fast digital slr I use this with my Nikon D90 DSLR. What can I say, except that it is fast! The card can keep up with this camera's high frame speed. I have not had any problems with it so far. Images transfer quickly from a reader or the camera. Rated 5 out of 5 by Mom of 7 from Super fast, large capacity My Nikon D90 never bogs down even when I take 10 pictures in a row. The card is very fast in down loading too! love it!